Nowadays, many people sit in front of the computer for 8 hours in offices and sit in front of the computer again for 2~3 hours at home after work. More than 10 hours are spent in sitting on the computer chair every day. That is the No.1 killer of the youth’s waists and backs and necks. Therefore, choosing a good the computer chair can not only protect our necks but also protect our waists. Also, sitting comfortably in the office can make you happy and improve work efficiency. It’s very important to choose the most comfortable office chair. Therefore, for the health, buy a safe, reliable and comfortable office chair is necessary for everyone. Then, which chairs are worth buying? The following article will introduce four hot sale office chairs. 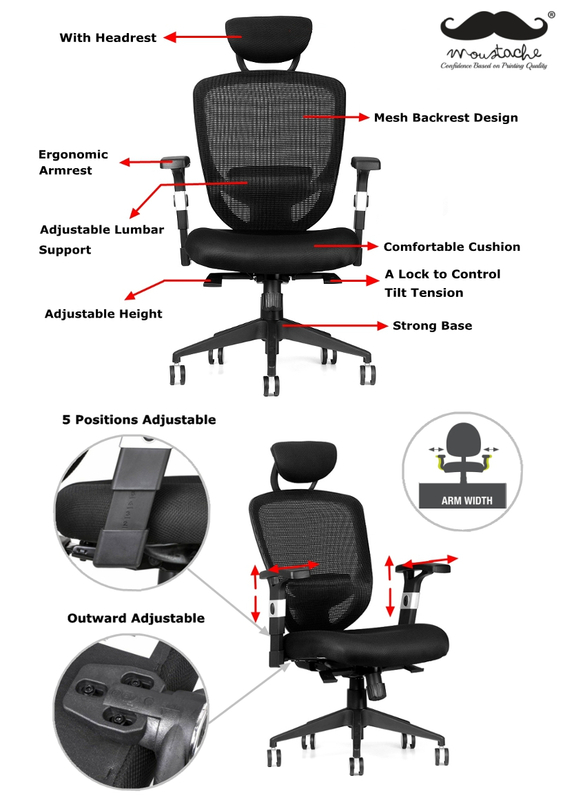 Moustache® Ergonomic Adjustable High-Back Mesh Office Chair is the best sale one. Built to deliver top performance, this mid-back task chair combines a slender profile with the full-scale comfort with a supportive, breathable mesh back. Contoured seat cushion features multiple layers of foam for added comfort and support. The chair can be calibrated to fit the body and support intensive computer work. Fixed arms allow you to rest their forearms while typing. Convenient center-tilt control features adjustable tension and upright lock to provide choices in posture. Five nylon bases are equipped with dual-wheel casters for easy chair movement. The outstanding characteristics of this chair are the ergonomically designed mid-back and the outward adjustable armrests. Moustache® Ergonomic Adjustable Mesh Office Chair features active lumbar support and a mesh screen back. Mesh screen back provides increased breathability while adjustable padded lumbar support maintains the natural curve of your spine. Functions include one-touch pneumatic seat-height adjustment, 360-degree swivel or easy maneuverability, and multifunction adjustability for maximum comfort. Equipped with a headrest for added comfort and support. Multifunction adjustment means you can change the seat height, tilt recline, back angle, and back height to suit your needs. The outstanding characteristics of this chair are including 5-position-height adjustable and outward adjustable armrests, with headrest as well as the ergonomic armrests. Moustache® High-Back Bonded-Leather Office Chair with Armrest is good value with interesting ergonomic adjustment. This chair comes standard with a sliding seat and adjustable height. Coordinated with thickening and non-horizontal cushions and PU surface’s armrests. Enjoy working in comfort even during long shifts in this Moustache® office executive chair. This supple chair features black high-quality PU Leather upholstery that gives it the feel of leather, ensuring it feels good against your skin, cleans easily and retains its good looks even with regular use. Completely relieve your fatigue, not tired for a long time sitting.Equipped with molded foam cushion, let people feel comfortable after long time work. It is applicable for both office and home study. The high-back leather backrest and the PU surface’s armrests are the excellent characteristics of this chair. Moustache® Office Mesh Task Mid-Back Chair with Armrest comes standard with a sliding seat and adjustable in height. Web mesh back of this mesh office chair conforms to your body for cool, ventilated and supportive comfort. Built-in lumbar support provides added back comfort. Height can adjustable, armrests help reduce arm fatigue. Stable 5-blade base with dual wheel swivel casters for easy mobility. The designs of mesh back and ergonomic backrest and armrest are prominent. There are so many main points about buying an office chair. The four chairs above seem very good. Each has its own advantages. If the price is your stumbling block, but as the saying goes “The body is the capital of revolution”, health is priceless. Our daily work is unseparated from the chair, buy an ergonomic chair is worthy. The chairs which are mentioned above are on a big sale, there is no reason not to buy one.